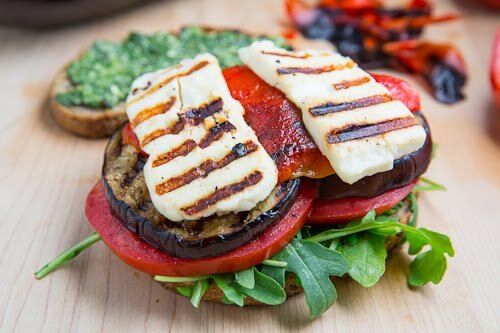 These tasty grilled eggplant, roasted red pepper and halloumi sandwiches are a great way to enjoy late summers produce! Cypriot cheese that fries well, retaining its shape rather than melting and gets ‘squeaky’ once fried. Simple fried halloumi with a splash of lemon juice is amazing all by itself but it also makes a great addition to a sandwich such as this one! I am still a little conflicted as to whether I should be diving into fall dishes or relishing the final days of summer and summer won out with this sandwich and I finished it off with field ripened beefsteak tomatoes and some fresh homemade basil pesto ! Lightly brush the eggplant and bread with oil and season the eggplant with salt and pepper. 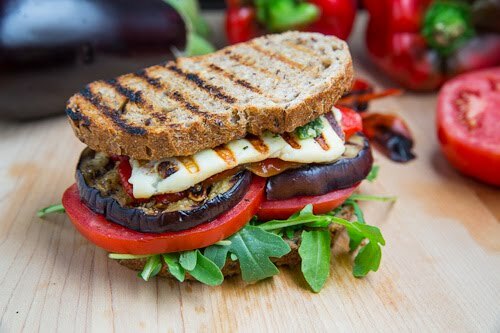 Grill the eggplant over medium high heat until tender, about 2-4 minutes per side. Lightly grill the bread and haloumi on both sides and then hit the halloumi with the lemon juice. haloumi's a CYPRIOT cheese, tho. even here in Greece, it's always imported from Cyprus. OMG That looks heavenly. Have to give this a try. At the risk of sounding pedantic, Halloumi is not a Greek cheese but a Cypriot cheese. I grew up on halloumi and we even used to make our own. A very quick snack is to fill a pita pocket with a halloumi, a few slices of tomato, some oregano (and if you can find it, some 'lountza', a Cypriot wine infused smoked meat) and then grill it. Delicious. That is sorta, kinda my perfect sandwich. All my favs in one place! Your posts have been making me drool lately. Kevin, this was a great hit with my family tonight, they loved it. I served it with a bowl of chile (red beans and ground beef). I sent your blog to my son that lives in Chicago and like you, loves to you. Thank you for posting your great recipes. This looks amazing! and you just reminded me to make pesto before all of my basil is gone for the season. Hello Kevin, what a fabulous Greek inspired sandwich. 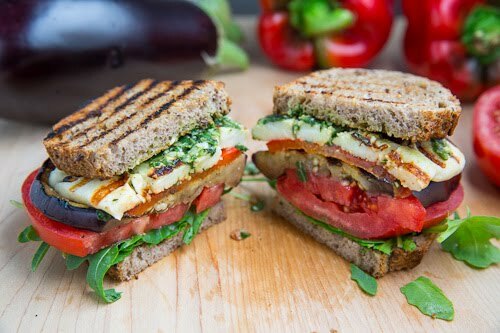 Everything I love, Halloumi, aubergine, tomatoes and pesto (ok that's not Greek). This sandwich I will try and know it will become a favourite in our house. Anonymous: Cypriot not Greek, corrected, thanks. That lountza sounds good! I will have to see if I can track some down! Awesome recipes I wish to try each one ! I've also been peeking through your pumpkin recipes. We're moving into Spring here in Melbourne but it occasionally I do miss this pumpkin-crazy time of year back in the US. I've bookmarked the pumpkin and black bean burritos for dinner this week!